"add an air of elegance and old Hollywood glamour to your wedding day look"..
A Bridal or Wedding Wrap can serve as both a memorable fashion statement and a functional accessory on your big day. Wraps are both functional and decorative. They add an air of elegance and old Hollywood glamour to your wedding day look, while also preventing the bride from catching a chill - whether at a winter wedding venue, or a breezy beach ceremony. Wraps can also act as a comforting security blanket of sorts, and keep the bride from feeling over-exposed. This short-sleeved shrug is intricately adorned with crystal beading and sparkly sequins. Available in ivory and white from designer, Alfred Angelo (style no. 1646). What is a Wedding Wrap? Here's where things get a little complicated. "Wrap" is a fairly broad term, which can mean anything that wraps around the bride. 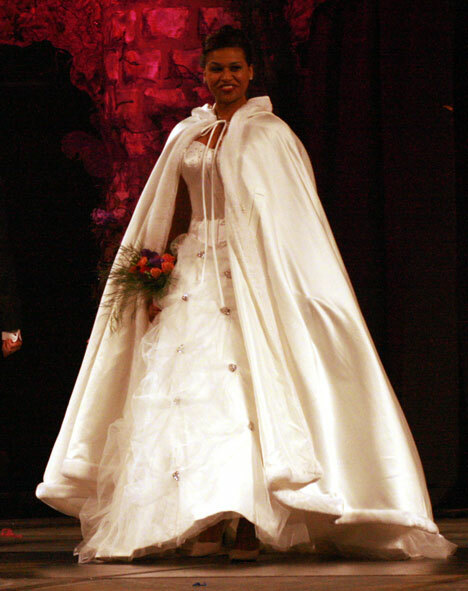 The word wrap is most often used to describe a garment wrapped around the upper torso, such as a cape, shawl, stole, shrug, cloak, capelet, etc... Winter wedding wraps are most often fashioned from fur or faux fur, while warm weather wedding wraps can be made of anything from silk, to pashmina, to lace. Different styles of wraps often overlap (no pun intended). For example: a short cape can qualify as a capelet or a stole, and a stole is technically a type of shawl. To help alleviate some of this confusion, and to help you choose the best bridal wrap to go with your wedding dress, we've organized the following series of different styles of wraps into the categories that best describe them. A shrug is a tailored top which is cropped just beneath the bust line and often looks like little more than sleeves. A long-sleeved, sheer shrug adorned with crystal beading at the sleeves and shoulders. Available in sizes 2 to 28W, at Alfred Angelo (style no.1869). A shawl is moreso defined by the manner in which it's worn. Basically, the word "shawl" refers to any square piece of cloth (i.e. a scarf) draped loosely over the shoulders and arms. This handmade, 100% silk shawl is ideal for keeping the breeze at bay during a summer or destination wedding. Embroidered with beads and roses, this 17" (W) x 60" (L) shawl is available to rent at Montreal's Miracles Etc. A Stole is a type of shawl made from expensive and often heavier materials, such as brocade and fur. Stoles are also typically narrower than shawls. 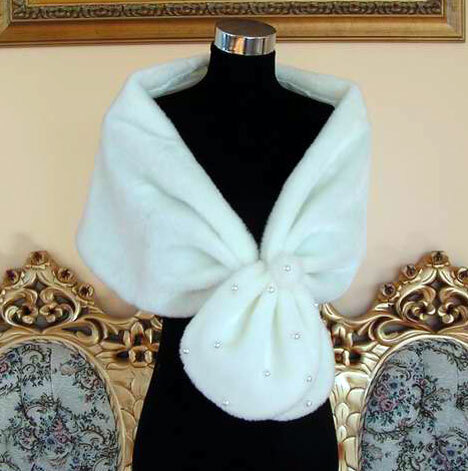 This glamourous, old-Hollywood style fur stole is adorned with pearl beading and tied in a bow at the front. 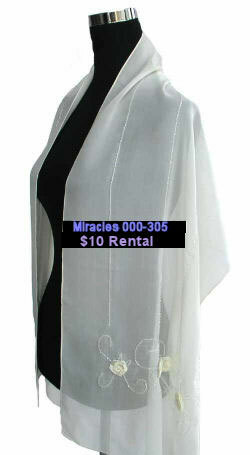 This Stole is available at Best for Bride in Toronto. 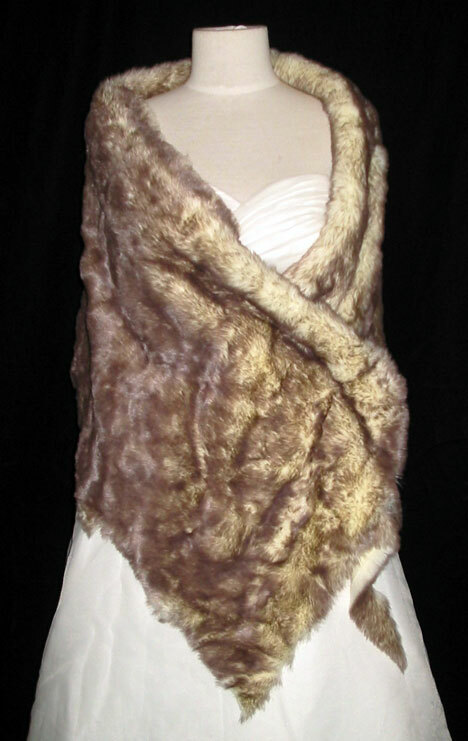 Faux-Fur Stole Mitchell Accessories, Markham Ontario. 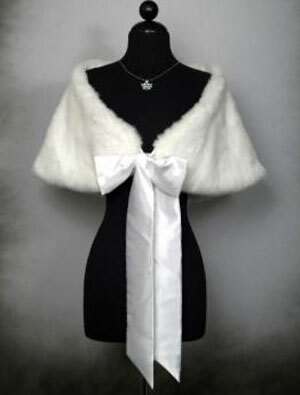 This sumptuous faux fur stole adorned with a long satin bow is perfect for a winter wonderland wedding. Shown here in white, this stole is also available in pale ivory, black, and dark brown at Mitchell Accessories in Markham, Ontario. This retro-style luxe golden stole is courtesy of Alberta's Keli Bridal. This Marilyn Monroe-style stole would make a perfect wrap for a long, slinky wedding gown. Available in white, black, and ivory from Mitchell Accessories in Marham Ontario. 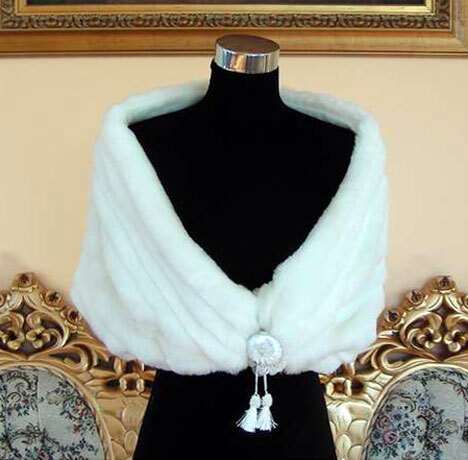 This v-neck fur stole in ivory is fastened with eye-catching tassels that are handcrafted from satin rope. Available at Best for Bride in Toronto. The word "Cape" technically refers to any sleeveless outer garment (i.e. a poncho), but is most often used to describe a long garment which fastens at the neck. Perfect for a winter wedding, this floor-length cape is the picture of plush elegance (and warmth!). Courtesy of Keli Bridal in Alberta.